Lots of things in video games sound too good to be true. But what about when it's the other way around—when something is too good to not be true? Erhm, you know what I mean. Street Fighter's mysterious "Sheng Long" character. Like so many errant rumors, this one got started thanks to a copy error. Players became convinced that there was a secret character buried in Street Fighter II after they saw Ryu's message "You must defeat Sheng Long to stand a chance" at the end of victorious matches in the original arcade version of the classic fighting game. The term "Sheng Long" was actually just a mistranslation of "Dragon Punch," one of Ryu's special moves. Electronic Gaming Monthly (EGM) helped spread the rumor with an April Fools' joke claiming that Sheng Long was a secret character. While Sheng Long has never appeared in the digital flesh (YET) in a Street Fighter game, the mythical character has been the subject of many inside jokes since the rumor was first spread. He also served as part of the inspiration for two other characters: Akuma and Gouken. The NPC who haunted Minecraft. After Minecraft was first released, players began to speculate about a creepy white-eyed NPC named "Herobrine" haunting the game. Legend had it that he was an homage to Minecraft creator Markus "Notch" Persson's dead brother. The only problem? The game's developers at Mojang repeatedly insisted that Herobrine didn't exist, and Persson had no deceased brother. Eventually, Minecraft's developers decided to start having fun with the joke as well, so they began adding images of Herobrine to the game's promotional artwork, and sneaking in the occasional "removed Herobrine" line to a list of patch notes. After Blizzard first released Diablo back in 1996, fans of the action-RPG began to speculate about the existence of a secret level that contained sentient cows of some sort. The developers enjoyed this mythical bovine level so much that they created one for Diablo II when that game launched four years later. It was called "Moo Moo Farm," and required a special combination of items to be accessed via a portal. The tradition continued with Diablo III, though the cow level in that game is much more difficult to gain access to. Who knows—maybe that's the real story of the secret cow level in the very first Diablo as well. Similar to the Sheng Long in Street Fighter, players of the original Mortal Kombat arcade game became convinced that there was a hidden character known as "Ermacs" after seeing the term on one of its harder-to-find menu screens. It seemed convincing because it was listed right below a menu item referring to Reptile—one of Mortal Kombat's actual hidden characters. And once again, EGM helped propel the myth when it published a letter from a reader who insisted he'd discovered a way to unlock Ermac. In reality, "Ermac" just stood for "error macros"—a technical term for a software process designed to help keep the game from crashing. Mortal Kombat's developers picked up on players' enthusiasm, however, and eventually added Ermac to the game as a playable ninja character endowed with telekinetic powers. Ok, this one has to be my favorite—just because of how the rumor first came into being. According to the video, Grand Theft Auto: San Andreas players took a blurry and heavily pixellated painting in protagonist CJ's house as a sign that the legendary Sasquatch was hidden somewhere in the game. Because the painting showed a fuzzy image of a figure looming in the forest, obviously. San Andreas players never found Bigfoot, but GTA developer Rockstar decided to have fun with the myth for years after. First, they inserted a Sasquatch character in the Red Dead Redemption zombie-themed expansion, Undead Nightmare. This came complete with an achievement for killing the Sasquatch that was titled "Six Years In The Making"—a reference to the fact that Undead Nightmare launched exactly six years after San Andreas. And then in 2013 Rockstar finally added Bigfoot to a proper GTA game with the release of Grand Theft Auto V. Well, sort of—as players who completed the relevant sidequest discovered, Bigfoot was actually just a deranged man dressed up as the mythical creature. Oh well. 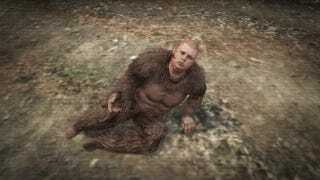 Maybe the real Bigfoot will make an appearance in the new-gen versions of GTA V.
The takeaway here? Never let anybody dismiss your overactive imagine, gamers. If you keep insisting something exists, who knows? A game developer might just get inspired by your unwillingness to take no for an answer. Check out more gaming-themed trivia goodness at the "Did You Know Gaming?" YouTube channel.